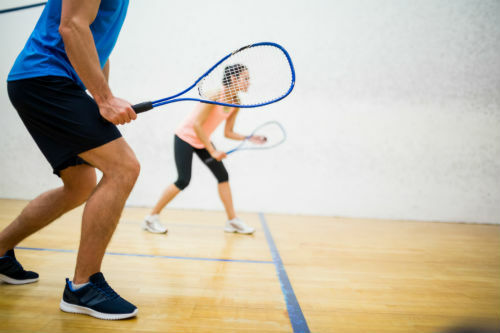 Use of our squash courts is included in your membership at St Albans. We offer something for all abilities whether you're looking to try a new sport or are interested in joining one of our members' leagues. Squash is an excellent way to get an effective cardiovascular workout, regardless of your ability, gender, age or fitness. At out St Albans gym, we cater for players from the age of 3 to professional level and beyond – our oldest player is in his 80’s! And the great thing about being an indoor sport is that you can play year-round without worrying about the British weather. It's easy to meet new players at our club. We run a number of members' box leagues for players of all abilities. On Saturday evenings from 17:30 - 19:30 we also run a social squash night. Coaching starts at just £20 with a free 20-minute taster lesson for any new Nuffield Health member. Any new member can book a free taster 20-minute coaching lesson with Gary. During this lesson, Gary will assess the player’s standard and will recommend which appropriate individual coaching and relevant coaching course or workshop will suit the player. Individual 1-to-1 coaching lessons cover aspects of the game relevant to the player, with an aim to improve technical ability, tactical play, movement and fitness. 1-to-1 coaching is booked as 30 minute, 45 minute, and 60 minute lessons and start at £20. Pairs training involves 2 players of a similar standard booking a 45 minute or 60 minute session with one of the Nuffield coaches. Practice routines and technical coaching are covered in physically active sessions. Prices start at £20 per player. We have 6 courts available to hire. Courts can be booked by using the booking sheet at reception. Courts can be booked in 30 or 45-minute slots. Racket and ball hire is available at reception.